Legal Warning: People and bird nests often collide. And caring people often wonder whether or not to move a nest that seems to be in danger. 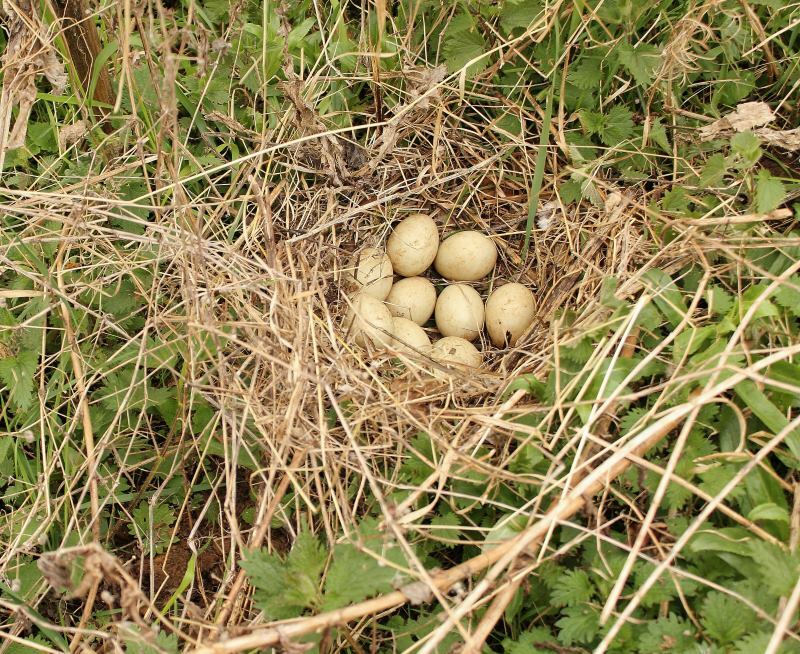 The first thing I have to say is that the U.S. Migratory Bird Treaty Act makes it illegal to tamper or move the nest of a bird while it has eggs or chicks. Both mallards (Anas platyrhynchos) and American robins (Turdus migratorius) are covered by the act, which is both U.S. law and an international treaty. This site by a group of lawyers who offer to defend people charged with violating the act lists two cases where prosecutions occured. In both cases, the problems were with commercial firms disrupting nests in a fairly blatant way. One case involved cutting down a tree that held the nests of egrets and black-crowned night herons, and the other involved bridge repairs that disrupted nesting falcons. I doubt the U.S. 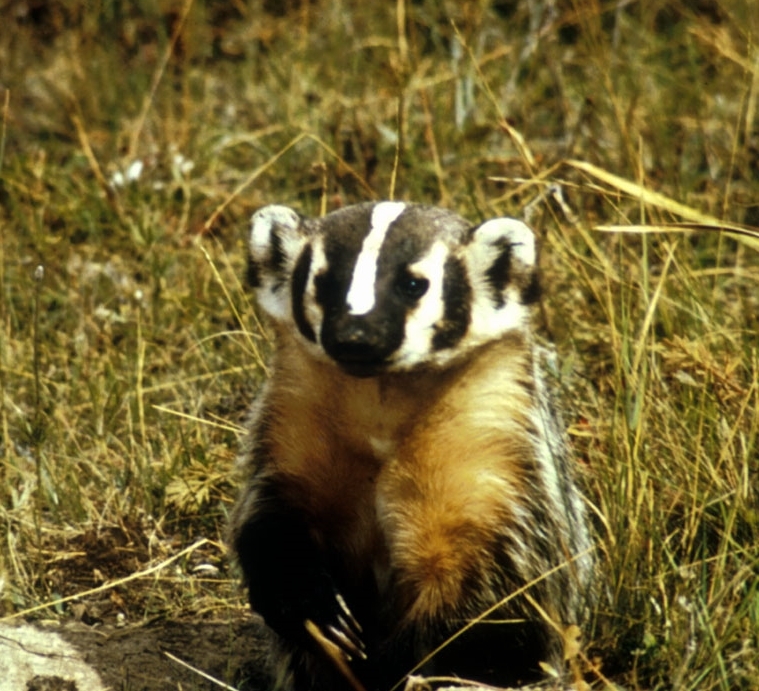 Fish and Wildlife Service has any interest in prosecuting homeowners for moving nests of common birds such as mallards and robins, but if you are unsure, you should contact Fish and Wildlife to see whether you need a permit to move a nest. Not all birds are covered by the Migratory Bird Treaty Act. Non-native birds such as starlings and house sparrows are not covered, for example. A Lesson from Pet Birds: When I used to raise pet finches and parakeets in large flight cages, I discovered that if I moved a nest several feet all at once, parent birds were often confused. It seems that at least some birds have a memory of where they nested. Even if the moved nest was clearly visible on the other side of the cage, they often ignored it. However, I found that if I moved a nest a few inches at a time, parents had no trouble recognizing it, and would follow it around the cage. If I moved a nest in small steps, I could pretty much move it wherever I wanted to, and the parents would continue to recognize the nest as their own. Lizanne’s mallards: Mallard incubation takes about a month, and Lizanne’s dock construction was due to begin before that. The good news is that once mallard chicks hatch, they swim off to find food and don’t need the nest. I feared that if Lizanne moved the nest all at once to her neighbor’s dock, the mallard hen probably wouldn’t find it, so I suggested she move it a few feet at a time. And the nest should be moved while the hen was not sitting on it. Near the end of the egg-laying period, the hen would begin sitting on the eggs for most of the day, so it would be hard to move her. 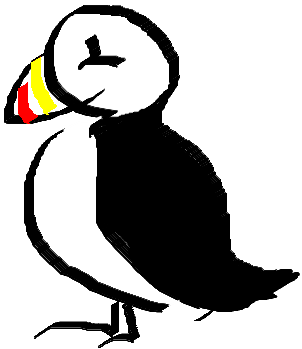 I also suggested building a floating platform and anchor it near where the original dock is, and letting the nest stay as close to its original location as possible. Betsy’s robins: I was sorry to hear of Betsy’s robin nest accident. I know she felt terrible about it. I suggested moving the flower pot a bit at a time, because the robin might not recognize the location of the nest on the floor. However, I wonder if the robin will abandon the nest no matter Betsy does. With all her eggs gone, the female robin’s instincts would tell her that a predator had found her nest. Although birds often renest if the first clutch of eggs/chicks is eaten, they may build the new nest in a new location. This makes sense, given that a predator has found the nest and would simply raid it again. A mother robin presumably wouldn’t recognize Betsy’s care and concern and its instincts would tell it that the nest was not in a safe location. Better to start over somewhere else. Cite this article as: Pelletier, TC. (June 14, 2015). Move a bird nest? 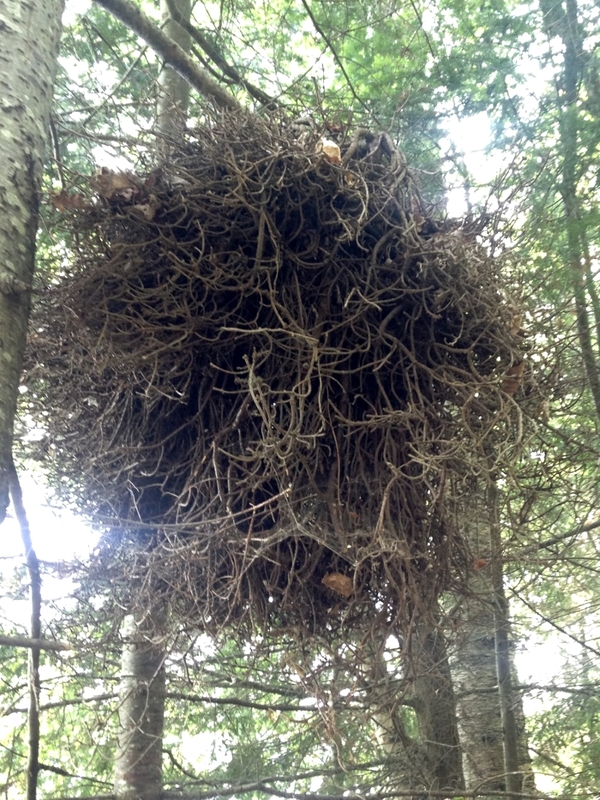 Retrieved from http://askanaturalist.com/move-a-bird-nest/ on April 22, 2019. Previous PostWhat is this small jelly blob on a beach in Maine?Next PostAre these orange ants or spiders? I found a bird nest in my dryer vent outside. I tried cleaning it out but the next morning I heard a little bird tweeting in the vent. What should I do??? Sara, sorry for the delay in responding. It’s hard to give you good advice without seeing the actual situation, but if you decide to move the nest, you could try and move it a little bit at a time. Move it a foot or two and see if Momma bird finds it. Once she seems like she is okay with the new location, move it a couple more feet, etc., until you get it where you need it to be. Or, if you can just wait, that’s probably the safest. Most small birds like robins fledge in just a couple of weeks, so you wouldn’t have to wait too long. We have a robin laying building a nest in our barbecue. Now it has layers about 7 eggs and we think we should move it, if we don’t my dad can’t barbecue anything for months. Can we move the nest? Need immediate advice. Discovered bluebird nest with 2 feathered nestlings under cover of propane tanks on our travel trailer. We leave tomorrow for several days. 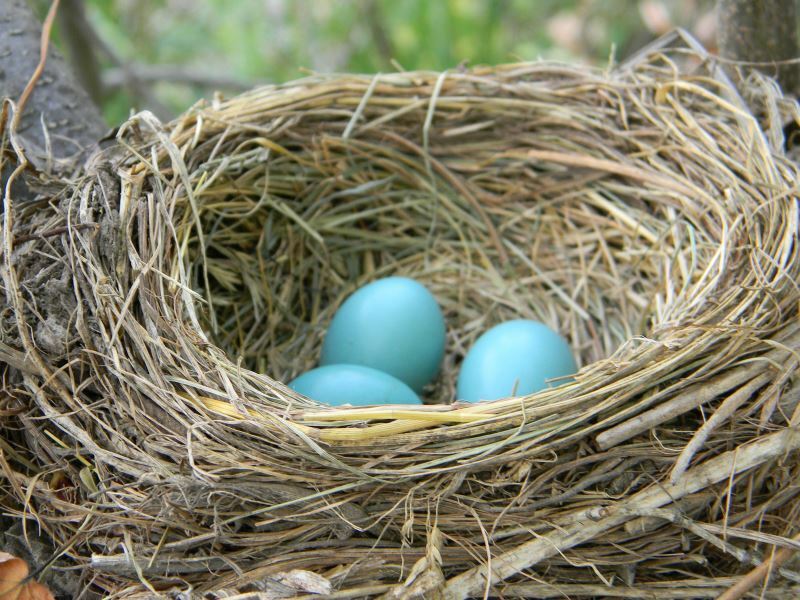 Can I move nest & babies to a nearby empty nest box? I have never noticed parent birds near the trailer, so the nest discovery was complete surprise. Just realized they are carolina wrens. Parents were both at the nest just now. That makes me not want to put the nest in bluebird box. (I kind of wondered why so much moss & dry leaves, not typical of blues.) I will have to rig up a shelter near the camper parking pad. Any other advice? I have what I think is a robin nest in a hanging flower pot. The birds are hatched and are old enough to have feathers. (or wherever the proper term is). My question is can I move the nest, plant new plants and put the nest back where it was and the parents not abandon the nest? Hi. There was a sparrows nest behind the siding close to the roofline of our house. My husband cleared the nest and there were 4 babies that fell out. I scooped up the nest and tucked the babies back in it and set on the window flower box a few feet below the original spot. The parents keep fluttering by the siding and a few times flew to the flower box but they don’t go to the nest. Will they find it.? Babies don’t have feathers yet and I am concerned! If they don’t find it by tomorrow are they to small to be supplemented? Hi Tom, thanks for responding to my question. I’ve decided to just leave the nest alone and let nature do her thing. The hanging plant is on my porch and I see Mama coming in and out several times a day, from what I can tell without disturbing the nest, it probably won’t be too long before they take wing. I can wait.. Thanks again. There’s a nest with two eggs nestled in my outdoors seat cushions. There’s lots of birds around but I have not seen any one bird(s) where the nest is. It went through a lot to build such an elaborate nest to just leave them there. We’re always outside moving past the furniture it’s under our pergola. Will the squirrels get at it? It’s two little grayish eggs. Hi, we found a Robin’s nest with 3 eggs in our race car hauler and have to move it. The closest tree is about 30 yards away. We got a bird feeder and turned it into a birdhouse. We hung it in the tree and the momma could not find it. So I moved it back to the car hauler right outside the door and she is back nesting on her eggs. It’s off the ground about 5 ft and right now still protected by the hauler. Problem is in 2 days we are going racing and hauler will be moved and it would be sitting there all by itself in the driveway. How often and how far at a time can i try moving it so momma comes back. (I am trying hard because we had another nest right outside our house in a little pine tree started with 5 eggs and then 2 disappeared. The other 3 hatched and were about 8 days old and a hawk took them. It was so sad watching their momma crying for them.) I dont want to lose these. Any help or suggestions would be appreciated. There is a robin nest with 4 eggs built on the top of a wreath hanging on our front door. The wreath is flimsy and has fallen in the wind in the past. What should I do? Secure it somehow? I would use duct tape but not sure about using tape on my painted door. They built the nest overnight and laid the eggs overnight in it. If I move it to the railing will the robin go to the nest? If it gets windy it will surely fall to the concrete. Also we have a front porch and like to sit there and I’m worried if the birds will attack children near the nest. Hi Birdienana, I have not tried to move a robin’s nest, personally, but I think if you limit your moves to a foot or less, the parents will find it. It’s hard for me to picture your exact situation, but would it be possible to move it just a little at a time till you get it where you want it? Is the birdfeed/birdhouse covered? If so, you might want to use something else. The robins might not find the nest if it is inside a box. We just discovered that a bird built a nest on a shelf in our garage. I don’t know what kind of bird it is, but the eggs are pink and the bird is brown! We live in N. Florida. The bird obviously has been able to work around our schedule if opening the doors to get out and get food and sneak back in. Unfortunately we are headed out of town in 30 days and will be gone for weeks. Any advice on how we should proceed or who to call for help? Hi Lori, do the eggs look like the ones on this page? I’m thinking maybe a house wren. How big is the bird? In any event, I’m confused about how the bird is getting in and out of the garage. Are you saying it can only get in and out when you open the doors? Is the garage door generally open during the day? 30 days is about how long it takes for house wrens eggs to hatch and grow enough to fly away. Unfortunately, we don’t know how long ago the eggs were laid. If they were laid 10 days ago, you should be fine. If they were laid yesterday, it will be close. Any chance you could leave the garage doors open for a couple of days and ask a neighbor to close them once the birds are gone? I think you are right, she may be a house wren. She manages to get herself in and out daily when we open the door for a half hour at a time- she is very smart! Fingers crossed the babies hatch soon. Thanks for the info. I have a robin that has nested in one of my hanging baskets. Yesterday, we had a hard wind that blew a robin egg & a dove (Asian) egg out of nests in our backyard. We scooped up both eggs, without touching them with our hands, and put them in the nest in the hanging basket. The dove egg is not much bigger than the robin eggs. There were already 3 eggs in the nest. The female did return to and is sitting on the nest. This morning, the robin egg we put in is gone, but the dove egg is still there. Any thoughts or explanations as to why the robin egg is gone, but the dove egg is still there? It will be interesting to see if the dove hatches & then leaves the nest. I’m moving in 4 days from an apt. and there is a dove nest on my balcony table just under a small bbq grill. If I buy a pot to ttry and set the nest in, will the egg be abandoned? Makes me sad, but I have no choice but to move. Thanks Tom! Her best is under a grill on the patio table. Won’t she notice that the nest isnt covered anymore. I’m going to do my best. We have a sparrow nest on our porch light. It’s about eight feet off the ground. The parents have been there for over a month. We have found two babies. One dead one alive, placed back into nest on the concrete porch. We assumed they fell with one dying on impact and the other too young to get back into the nest. We now have two more in the nest, gapping and parents feeding. We are wanting to move there best or transfer babies to a safe spot,lower to the ground to prevent babies from dying in a fall. Is this safe or a good idea? What would be the beat way to transfer without parents abandoning babies? Currently we have placed a comforter in the porch to soften their fall should they fall. Yesterday morning I realized a nest had formed on our front door wreath. I didn’t look inside, but then last night we startled daddy sparrow off the nest (he flew into our house lol – he’s fine, we got him out). This morning i checked and sure enough, three little eggs. Should I try the moving the nest idea? How long to wait between the next move? Hi! Thanks for your response. I did move the nest about 1.5 feet and mama is happily in there, sitting on the eggs. The wreath was on the front door, and it’s really the only way in and out of the house. I had a terrible fear that someone would fling open the door and step on a fledgling (I have 5 year old twins….). 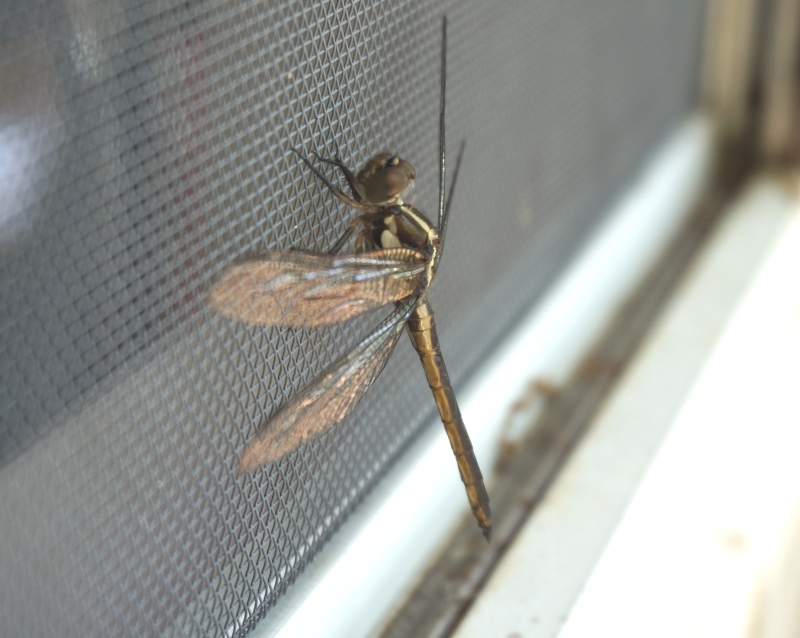 I’m wondering if I can/should keep moving her around until they’re on the far side of our wrap-around porch. It’s covered on that side, not in direct sun, etc. and they would have lots of privacy. I can’t figure out what sort of birds they are…maybe brown creepers? There is a robin’s nest in my backyard with a few baby birds in it. We recently had a big rainstorm and the nest is tilted a lot. I am worried that the nest will fall and I don’t know what to do. Does anyone know what I should do?